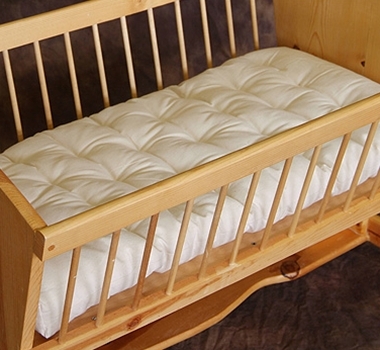 Give your baby a safe & cozy sleeping environment with this eco-friendly, all-natural cradle/bassinet mattress made of eco wool contained within an certified organic cotton ivory canvas fabric. The wool in this product is sourced in the Pacific Northwest of the United States from farmers who participate in the Sustainable Wool Program, producing high quality ultra clean wool from sheep flocks that are managed in a humane ethical way and in a chemical-free thoughtful environment. The wool fill is contained within sturdy, certified organic cotton in a natural ivory color. Clean only according to instructions provided. This item is custom made to order. Please allow 1 week for production in addition to shipping.